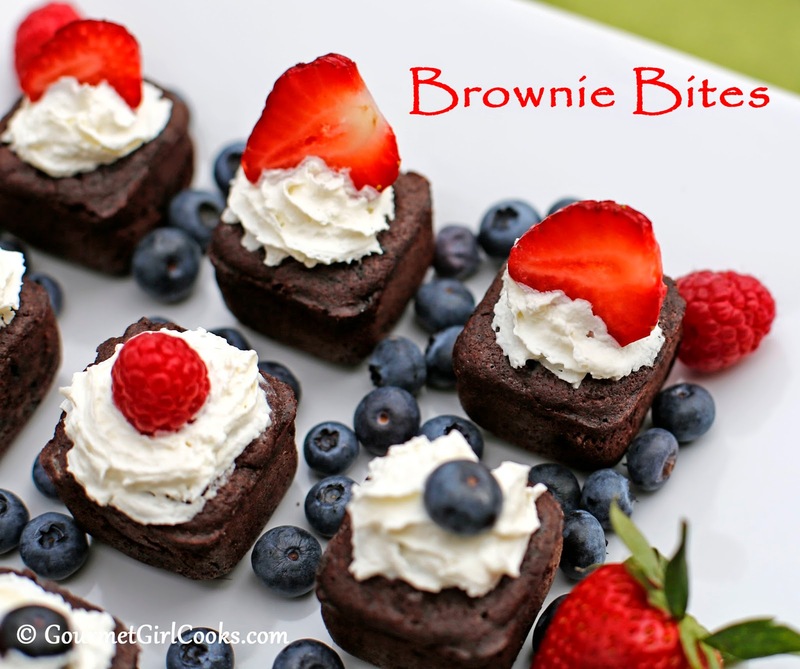 This evening I'm sharing a recipe I created a couple of years ago for Brownie Bites. These brownies are deep, dark, rich and fudgy. They're made with blanched almond flour, grass-fed butter and deep dark cocoa powder. To give them an extra chocolatey kick, I added a little bit of espresso which enhances and deepens the chocolate flavor, along with a few bittersweet chocolate chips. They are so easy to make and delicious to eat as is, but can be made even more decadent if frosted or drizzled with a glaze, too. If you like nuts in your brownies, you could add some finely chopped walnuts or pecans to the batter. 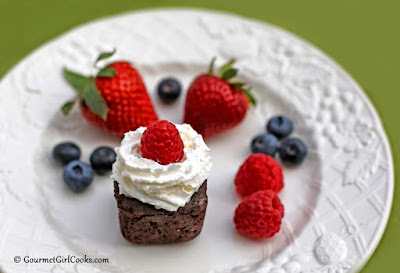 These brownies are topped with whipped cream and fresh berries like decadent little chocolate berry shortcakes and are amazing served that way. These brownies are low carb, grain and gluten free and are also low in sugar (the small amount of bittersweet chocolate chips adds a trivial amount of sugar). To make them completely sugar free, simply substitute sugar-free stevia sweetened chocolate chips (like Lily’s) in place of the bittersweet chips. The amount of sugar contained in the 1/4 cup of 70% dark chocolate chips used in this recipe is minimal (each brownie bite contains less than 1 gram of sugar). The recipe and photos can be found below. Enjoy! Preheat oven to 350 degrees F. Lightly grease a nonstick 20-well brownie bite pan or 24-cup mini muffin pan with coconut oil or butter. In a large bowl, combine melted butter, sweetener and vanilla. Beat in eggs one at a time. Stir in espresso powder. In a separate bowl, combine cocoa, flour, ground chia, baking powder and salt. Gradually blend dry mixture into egg mixture, adding half at a time. Stir in chocolate chips. 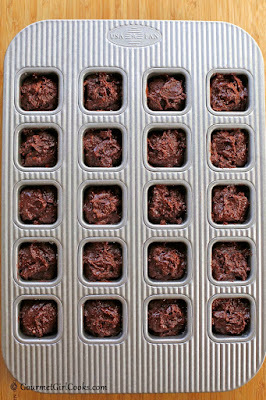 Fill each prepared brownie well or mini muffin cup two-thirds full with batter. 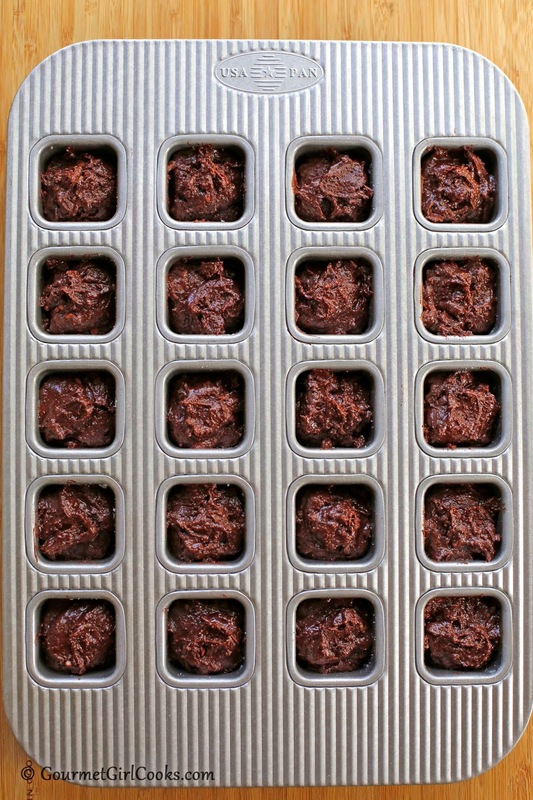 Bake for approximately 15 minutes if using brownie bite pan or 12 minutes for mini muffin pan, or until a toothpick inserted near the center comes out clean (a couple of moist clinging crumbs is okay). Be careful not to over-bake. Cool in pan. Remove by gently loosening edges with a plastic knife or spatula and then carefully pry and lift up edge of brownie and remove from pan. Yields approximately 2 dozen square brownie bites or 3 dozen round brownie bites. 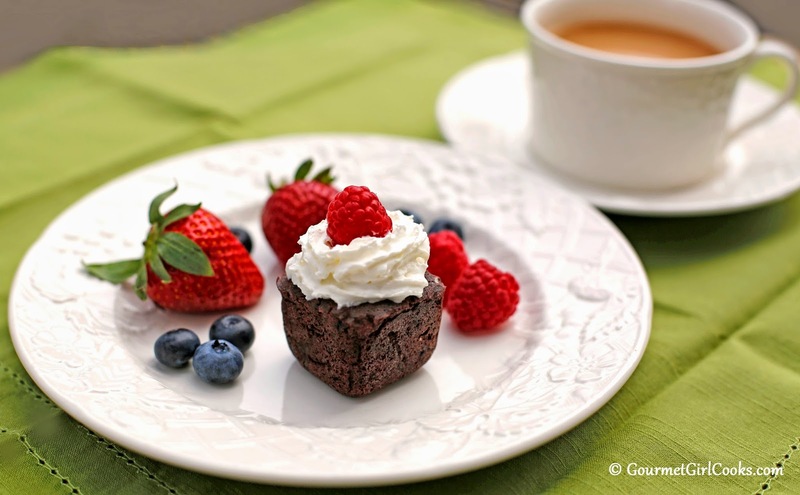 If desired, frost with your favorite frosting, drizzle with glaze or top with whipped cream and fresh berries. *Notes: If brownies don't release easily, place in freezer for about 15 minutes before removing from pan. Granular or powdered sweetener can be used, but if using an erythritol based sweetener (like Swerve or Truvia, etc. ), using a powdered version eliminates the grittiness sometimes created when refrigerating baked goods made with it. Ground chia can be purchased already ground or is easily ground in a small food processor or coffee grinder. Measure chia seeds after grinding because grinding them increases their volume. *Nutrition Information: a) For 24 square brownies, each contains approximately 1.8 grams net carbohydrates (total carbohydrates minus fiber) and less than 1 gram of sugar (0.72 grams); b) For 36 smaller round brownies, each contains 1.2 net carbohydrates and less than 1 gram of sugar (0.48 grams). Hi GGC! These look delicious and I love how easy they sound to make. I love brownies and seeing this grain-free version of Brownie Bites makes me crave some. I look forward to trying your recipe once I have all of the ingredients needed. Can the chia seeds be left out?